Seniors in the heartland are to get more internships and part-time work opportunities offered through an active ageing programme. The People's Association (PA) announced yesterday that 10 new companies will join the seven existing ones under its Senior Academy Golden Work Series. The jobs offered by the new partners - which include POSB bank, Japanese fast-food chain Yoshinoya and Pet Lovers Centre - will add 100 vacancies to the programme, doubling the total to 200. Launched in April, the Golden Work Series offers job skills-related workshops to seniors, who can then go on to try for internships, and part-time or light work opportunities at companies. They can earn between $5 and $8 an hour from this work. To date, 560 people have signed up for courses and 20 per cent of the available job opportunities have been taken up. The PA is also expanding the programme from 10 to 15 community centres (CCs). 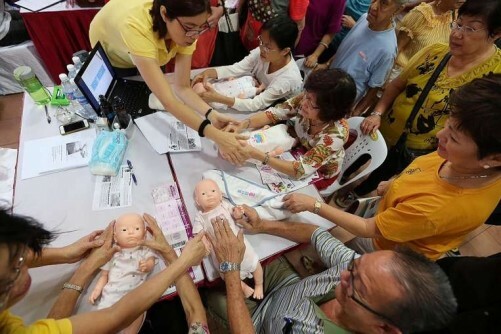 More than 500 seniors attended a programme showcase at Potong Pasir CC yesterday, where they got to try their hand at courses such as mocktail making and basic banking. Mr Sitoh Yih Pin, grassroots adviser to Potong Pasir and the event's guest of honour, said he felt the programme was especially useful in a mature estate like Potong Pasir. He said: "Many of our elderly, health permitting, would like to carry on working, meet new friends and earn some pocket money." New partner POSB will use the Golden Work Series to expand its own Active Neighbours Programme from 70 to 90 seniors. These part-time employees assist elderly customers and introduce them to time-saving practices, such as SMS alerts for queueing and using an ATM card instead of a passbook. They can earn about $8 an hour. POSB managing director Derrick Goh said: "Our elderly customers have taken to these Active Neighbours well, as they see them as their peers. The bank may seem like a cold place, but this makes it a warmer place to do transactions, so they don't feel so scared coming to the branch." Another new partner, Serenity Spanish Bar and Restaurant, will offer up to 26 service, kitchen and bar vacancies at its two outlets. General manager Nikko Thalawathugoda said: "We always have a shortage of staff, and this will help us during the peak period of October to Chinese New Year." Madam P. Indira Thevy, 63, joined a tea appreciation course about three months ago and got a part-time job with tea company Tea Ideas, where she packs tea and recommends brews to customers at roadshows. Madam Indira, who retired from her job in technology diagnostics seven years ago, said she joined Senior Academy because she was "very bored at home". "My four daughters give me pocket money, but I want to be able to spend my own money when I go out. It is very enjoyable work."